We have a new sponsor, Altenew, for this challenge! A randomly selected participant will receive a stamp set of choice from the Altenew shop, while the LEAD will be invited as a Guest Designer in a future challenge! Altenew is very generous and provided all the design team with a stamp set of their choice. I chose Doodle Blooms stamp set from Altenew. I simply used the colours from the inspirational graphics to make my card. I picked white as my base, stamped the leaves using Delicata Silver Pigment ink. Once dry, I coloured the leaves with copic makers E000 and E00. These colours I picked from the challenge graphics. 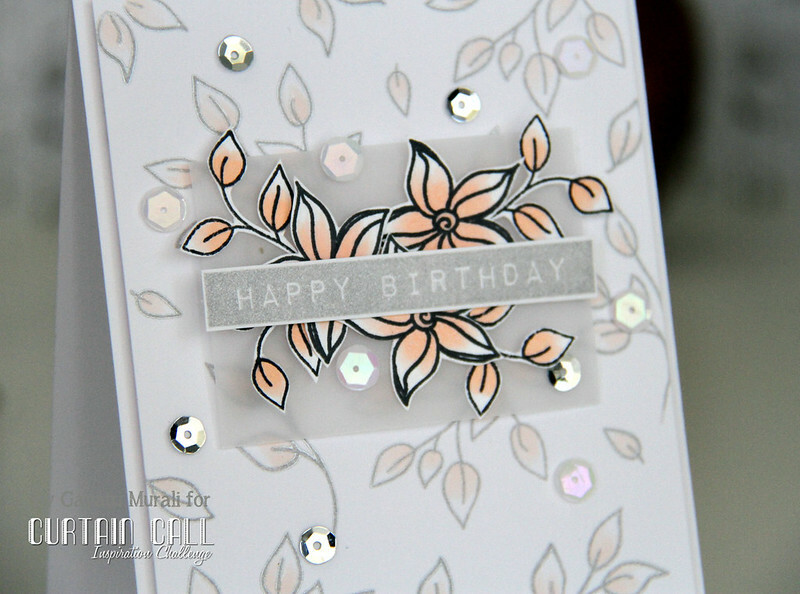 I stamped the leaves and flowers on white cardstock with black Memento ink and coloured with the same makers. Then hand cut them out. I clustered them on a small vellum panel. I mounted this vellum panel on the stamped card panel using foam adhesives. The sentiment is from Label Love stamp set also from Altenew. 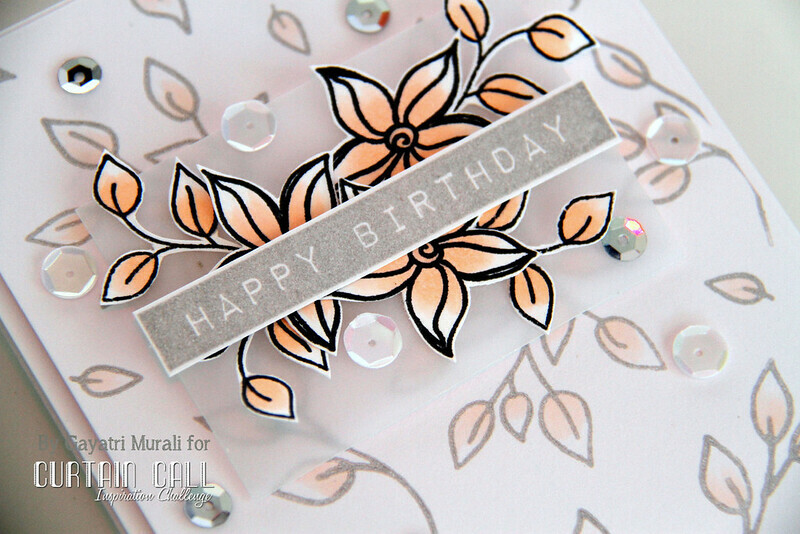 I stamped using Delicata Silver ink, cut out and adhered on the flower leaves cluster. The finished panel is adhered to the card base using foam adhesives. Finally embellished with silver and white sequins. So I have used a lot of white, a bit of light brown and silver from the challenge graphics. Hope you like it because I LOVE my take on the challenge. WOW!! This is totally fabulous!! I love the soft colors you used and all your layering. Really great design!! 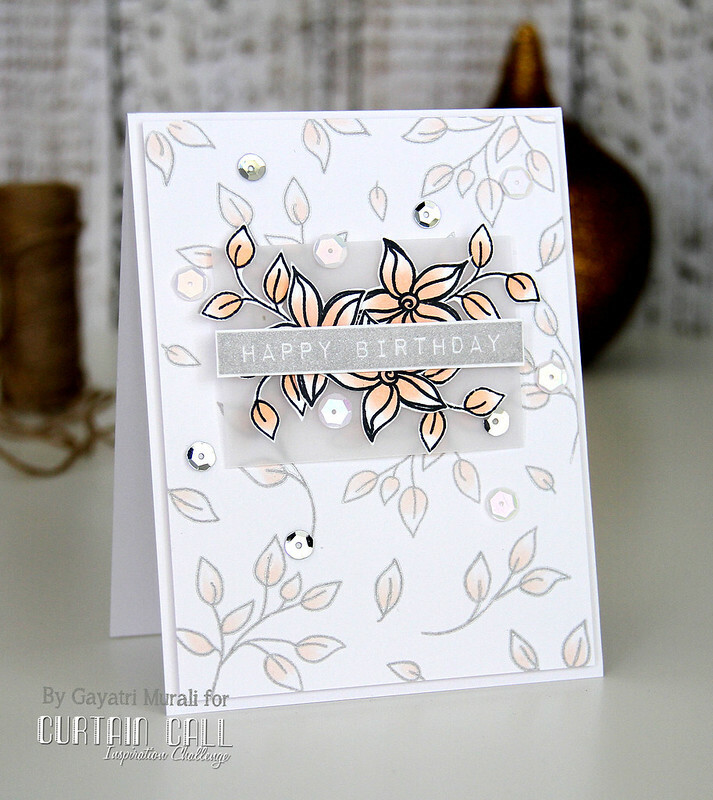 Beautiful card Gayatri. Love the background you created and the soft coloring. The greeting looks awesome in silver. Happy New Year! Beautiful, how you used the same leaves and colours of the background on the next layer; and added that to vellum. Great idea, to try out !